Four Enzyme Surgical Instrument Cleaners Lubricate while they clean. Only the ONEcleaner Enzyme Detergent Lubricating Cleaner delivers the four enzymes with surface cleaning detergents that are necessary to effectively remove all forms of surgical bioburden from surgical instruments. Surgical instrument cleaners that do not contain these four enzymes cannot remove all forms of surgical bioburden. The four surgical instrument cleaner enzymes are; lipase enzyme detergents to remove fat, amylase enzyme detergents to remove starch, carbohydrase enzyme detergents to remove high starches, and protease enzyme detergents to remove proteins such as blood. 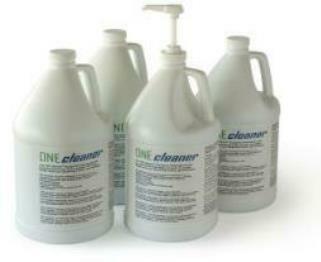 The ONEcleaner enzyme detergent surgical instrument cleaners that lubricate while they clean boost reprocessing productivity. The ONEcleaner medical instrument cleaners and enzyme detergent highly concentrated, low foaming, neutral pH, enzyme detergent surgical instrument washer sterilizer cleaners cut costs.